Home › AIR GUNS AMMUNITION › PELLETS H & N › Air gun pellets H & N Baracuda Match 5.5 mm. Air gun pellets H & N Baracuda Match 5.5 mm. 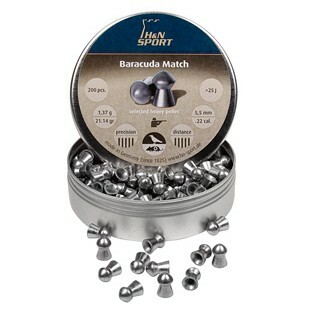 Pellets for air gun H & N Baracuda Match 5.5 mm. Caliber 5,5 mm. Weight 1.37 g. Quantity 200 pieces in box. Heavy and very accurate pellets with extra selected and marked head size, with smooth body. Designed for amateur shooting at long distances. Specially designed for strong rifles with high initial velocity. Smooth.